A Highly Feminine Showcase of Sapphire: Elegant, Modern, Sporty, Relaxed, Chic, Understated, Sublime, Magnetic, and Irresistible. For more than 10 years, the Big Bang One Click 39 mm has been revealing the multiple facets of its personality. From denim to linen, understated colors to Pop Art, St. Gallen Bischoff embroidery to Orylag® fur, its versatility is beyond doubt. But today, the multifaceted character has been laid bare. Completely stripped down, it confirms that beauty truly comes from within. An authentic watch cut from sapphire. Sapphire showcasing time itself. Transparent, with no false modesty, this piece quite simply is itself. Beautifully simple, but very striking, it bares both its soul and unabashed free spirit with the HUB1710 manufacture automatic movement at its heart without reservation. Its strength of character is symbolized by the resilience and hardness of the sapphire stone. Its lines are cut to enhance the transparency and brilliance of a material that can only be worked using diamond. 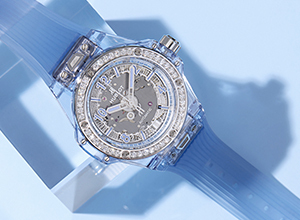 Demonstrating expertise in engineering and chemistry, Hublot has developed a costly, painstaking process which enables it to create very large transparent sapphires, boasting a uniform color. This expertise has opened up new territories of expression for sapphire. 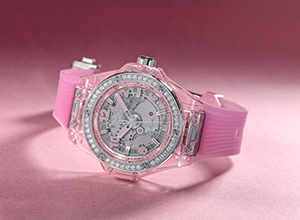 Hublot is constantly innovating, and is now adding this magnificent material to its women’s collection. 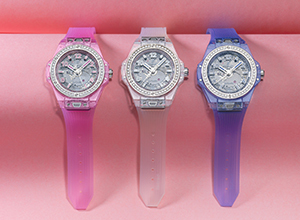 Its 39mm case takes on the shades of sapphire, and is also available in pink and sky-blue hues. A subtle fusion of aluminium oxide and titanium oxide creates the pink tone and iron oxide creates the sky blue. The bezel, set with 42 diamonds, dazzles with the brilliance of one carat of precious stones. The strap matches perfectly presenting a striking unity of color. The patented “One Click” attachment system, combines the extreme resilience of sapphire, and its magnetic beauty, with an interchangeable strap.